This is a quick tutorial showing how to use the Terrain Editor in Bryce to create a simple billowing curtain. 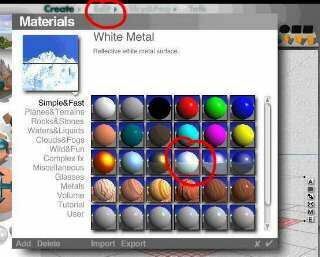 With the terrain selected, click on the arrow next to Edit and choose the ‘White Metal’ material, then click on the check mark to accept. 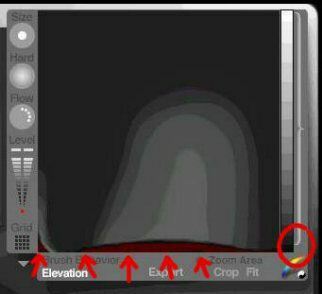 Click on the ‘E’ button next to the terrain to open the Terrain Editor. 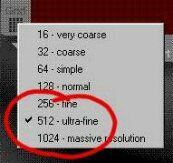 Change the brush Size to the largest size possible. Drag the level down as far as it will go, then back up very slightly. 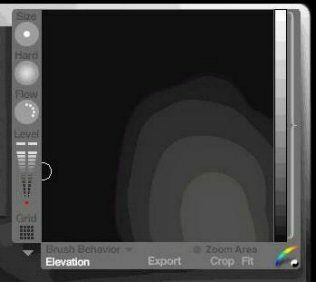 Paint over the entire terrain canvas, making sure that you move the brush off the terrain canvas to check for even coverage. Now, we’re going to lower the terrain as far as possible, without going to black. Drag the clipping bracket up ever so slightly so that just a smidgen of red shows. Now click and hold on the Raise/Lower button and drag ever so slightly to the right. You’ll be able see the first layer of color start to erode. 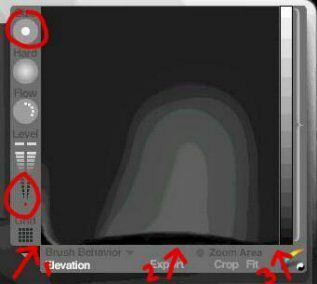 Continue lowering until the canvas looks black. If it goes to red, you went too far. Stop before you get nervous. Resize the brush to about the size shown and draw in a simple shape that looks sort of like a billow. Make sure that you don’t paint over the extreme far right edge at any time! There should always be a thin line of black there or the finished curtain will have a backwards flip. 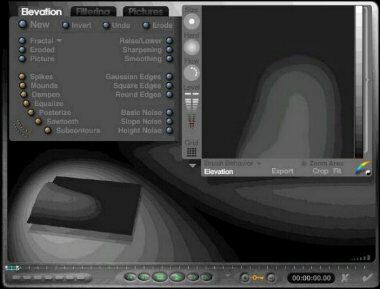 Raise the gray level slightly and draw over the billow to raise it slightly, continue raising the level and resizing the brush as needed until you are satisfied with the result. Don’t be afraid to change the shape. Keep an eye on the terrain preview to check on the results. Don’t forget about leaving the black line at the right edge. 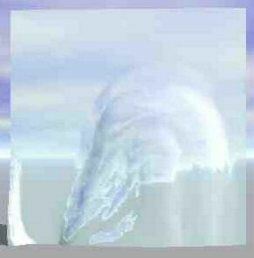 Take a look at the gray level indicator in the final canvas image to see how far up I actually went. Click on the check mark to accept the terrain. Here is the wireframe of my curtain, so far. Now you can either duplicate the curtain to start the next step (just in case) or you can add it to your Create presets, then continue (my choice). Here is a quick render of the curtain. You can leave the curtain as it is, but let’s add a flip at one corner. 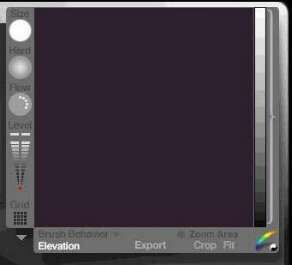 Click on the ‘E’ to go back into the terrain editor. 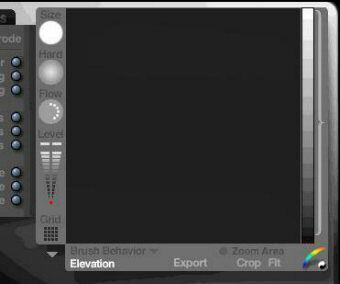 Drag the level indicator down almost to black and change the brush size to the smallest possible. 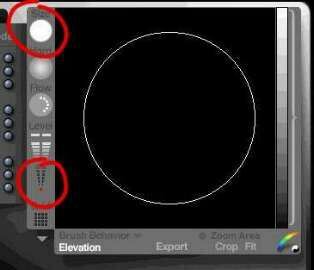 Choose a place to start the flip and move the brush as far left as possible without losing the cross hairs. Draw a flip shape (sort of a misshapen triangle), then drag the level indicator up a smidge and build it up slightly. Continue raising the level indicator and building up the flip, moving down a little to make a sort of triangle, checking the terrain preview until you are satisfied with the shape and height. Click on the check mark and view the flip in wireframe mode. Here is a quick render of the curtain with flip. After rotating the curtain, I rendered it again. Notice how even though we have a billow and a flip, the bottom of the curtain is still perfectly straight. 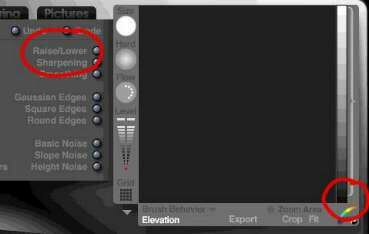 Duplicate the curtain or add it to the Created presets. 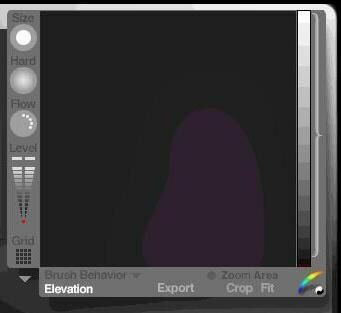 Click on the ‘E’ next to the curtain to go back into the terrain editor. 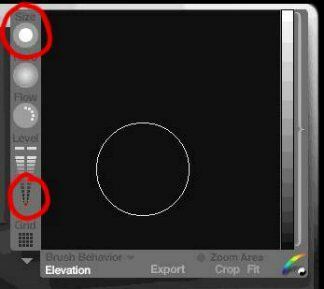 Change the brush size to the smallest possible and drag the level indicator all the way down. Now, start cutting out the bottom of the curtain: (1) flip cutout, (2) billow cutout (notice how the highest point of the cutout is at the lightest gray of the billow), and (3) right edge cutout. Raise the clipping bracket until the ‘cutout’ area goes barely red. Check for black patches (see arrows) and go over them with the brush to clean them up. Drag the clipping bracket up until red starts to show in the main curtain, then drag back down until only the ‘cutout’ is red. terrain. Change the Grid size back to 128. Click on the check mark to return to the wireframe view. 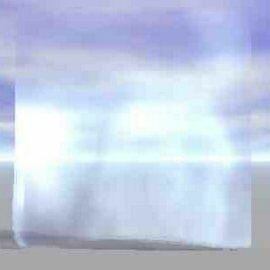 Here is the rendered curtain. 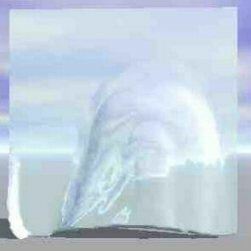 I did a few more quick touch ups to the flip, changed to the Cloud material ‘Jetstream’ and rendered again. You can make the curtain more ‘billowy’ by building up the ‘billow’ with lighter gray levels. Now, add a cylinder that has been hollowed out by a negative cylinder to the top, group the rod and curtain, then slip a curtain rod through it. I did have an image using the curtain, but I’ve lost it somehow. However, even though the curtain below was done differently than in the tutorial, it shows a finished curtain done in a slightly different billowing pattern with a sleeve and curtain rod. Imagine the possibilities.